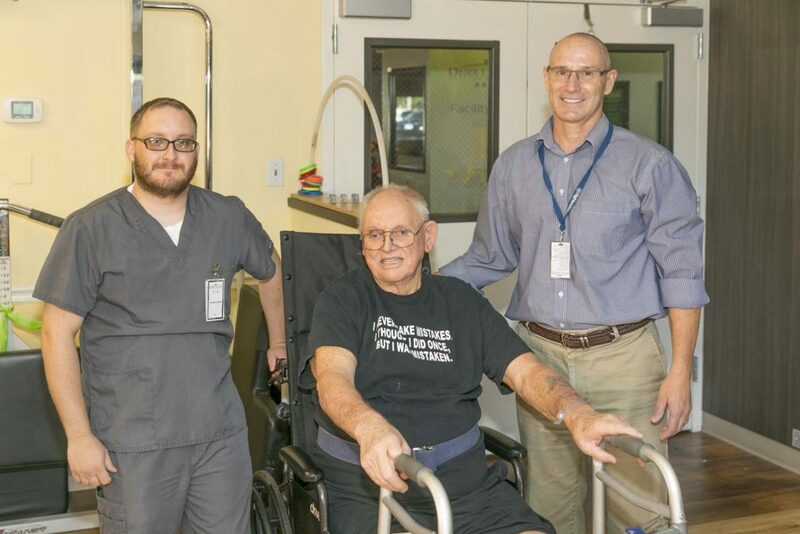 Our therapy staff is the heart of Desert Terrace Healthcare Center, and we take pride in the performance of both our therapy department and our entire care facility. As a collaborative effort among team members, our staff will work with your physician to create a treatment plan that works for you. We understand every patient has unique needs that require special attention, and our In-House Therapy Program is custom designed to address them. We provide a full-time in-house therapy team—no outside contractors or agencies—so our guests get to know their therapists, and vice-versa. We aim for just the right match between our patients and therapists for optimal results and comfort throughout all stages of recovery. Our therapy staff are dedicated full-time employees, so guests can rely on getting to know the same caring therapists for the duration of their stay. As part of the Desert Terrace team, our therapists receive education and training to ensure a solid continuity between therapy and nursing care. At Desert Terrace Healthcare Center, we work holistically with one goal in mind: to maximize your comfort and health. No matter your health needs, our rehabilitation team is ready to help you make a successful recovery. 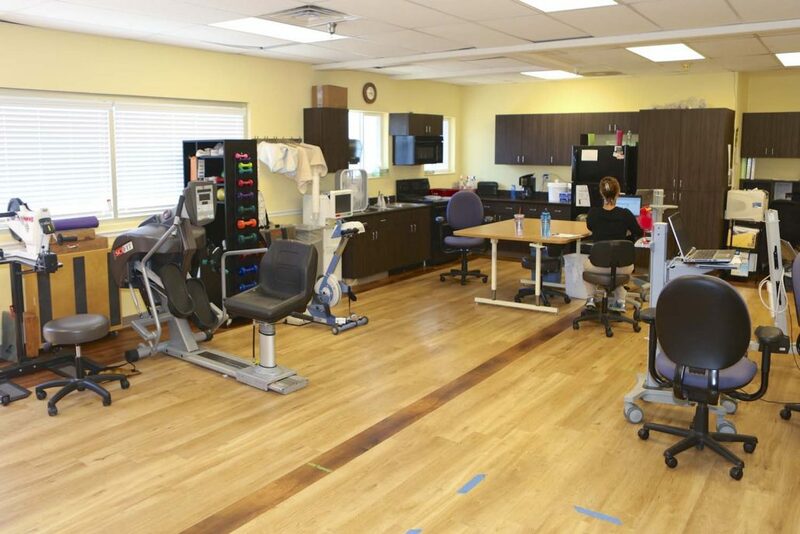 Our therapy team is passionate about bringing the latest techniques and programs to our patients. Through continuing education, our physical and occupational therapists apply the latest research to improve balance and reduce fall risk. 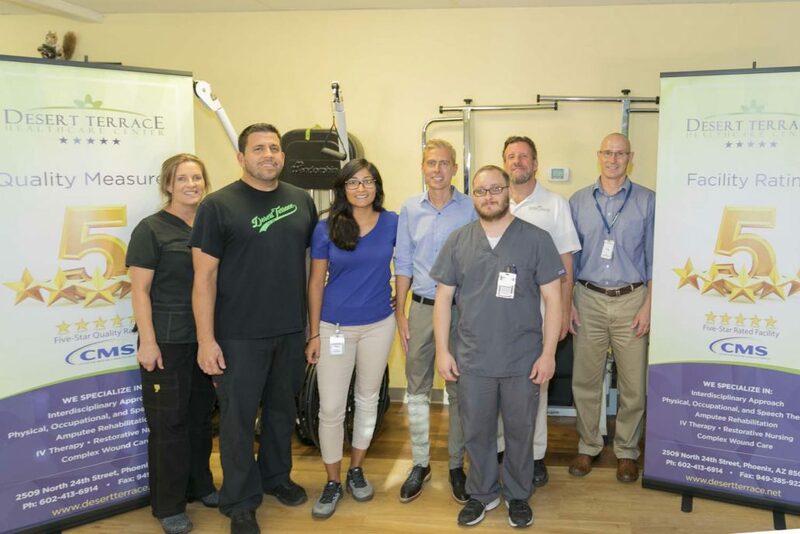 They also utilize therapeutic modalities combined with a full-service therapy program for strengthening, balance training, pain reduction, wound care, urinary incontinence, and increasing patients’ range of motion. Our therapists work together along with nursing, social services, activities, the business office, families, caregivers, and local communities to assess functional potential, and collaborate on the unique goals for every patient. At the heart of our Therapy programs is a deep awareness of the special needs of our more mature patients. This goes beyond the science and research—a human and compassionate understanding of the Art of Caring. Our team of professional Physical Therapists will assess and treat impairments in strength and function that occur as a result of injury, disease, age-related degeneration, or environmental factors. Physical therapy treatments are performed by our in-house physical therapist or physical therapy assistant. Desert Terrace’s Occupational Therapists will assess the impact that a decline in function has in the patient’s ability to participate in their life by performing everyday tasks such as dressing and bathing, or being able to return to work or engage in previous hobbies. Our team will assess the language, cognition, and swallowing dysfunctions of our patients. A Speech Therapist’s main goal is helping residents with swallowing difficulties, such as working with patients with modified diets to help them get back to eating the types of foods they love. At Desert Terrace Healthcare Center, we work with each patient, their family, and their healthcare providers to determine the care and treatment plan of action. When the ultimate goal is to return home, our therapists explore every detail of each patient’s living arrangements. We encourage family members to actively participate in the care so that they can help their loved one prepare for discharge. We frequently perform a Home Assessment; a tool we can use to develop a custom rehabilitation program that prepares our patients for any particular challenges they might experience once they’re home. 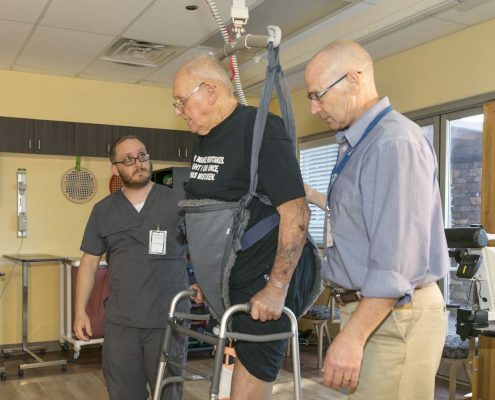 When the plan is to stay in our care facility for an extended period of time, we make sure to work side-by-side with our nursing staff so that our patients can continue to function at their highest level to preserve their independence and participation. We even provide screenings after completion of each program so that our patients are maintaining their abilities at the best possible level.